This tour gives us the best chance to explore Iran uncover! 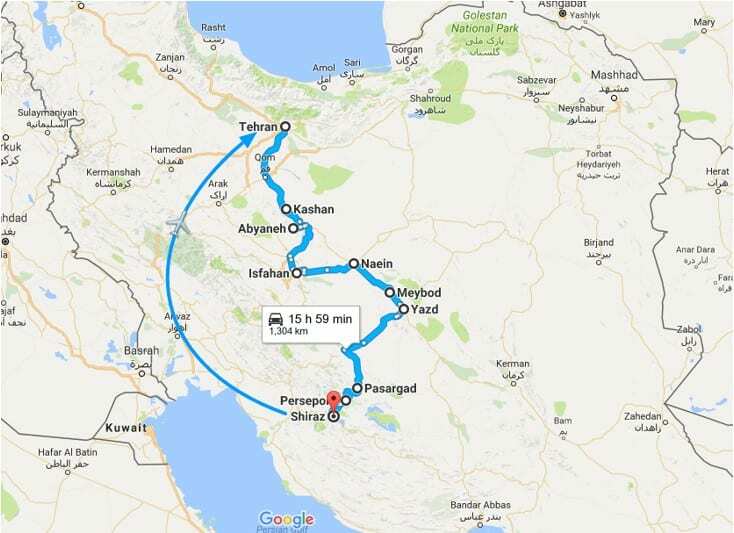 Starting with the Tehran, then continuing through the Isfahan and Shiraz. This can be safely called the most authentic trip. In terms of beauty, authenticity, great food, remains of forgotten ancient civilizations. this tour is among the best trips one could ever takes in one’s life. Note 3: Check-in time for hotel is at 2:00 PM. According to your arrival time, if you need early check-in you must book a extra day. We begin our journey to Tehran. You will visit National Museum of Iran, Golestan Palace, Treasury of National Jewels with huge number of fascinating Gold and Diamonds. Next day we departure from Tehran towards Kashan. In Kashan visit Fin Garden, Boroujerdis and Tabatabaei Traditional Houses. Next day we move to Isfahan to see Khaju and Shahrestan bridges, Chehel Sotun Palace, Naghsh-e Jahan (Imam) Square including Ali-Qapu palace, Vank Cathedral and Masjed-e Jame. But on our way to Isfahan, you will see Abyaneh village. Next day we drive to Yazd, to visit the Fire temple, a prayer place of Zoroastrians, and Tower of Silence and Yazd Jame mosque, but on our way to Yazd, you will see Nain and Meybod historical cities. Next day we drive to Shiraz, but on our way to Shiraz, you will see the capital of Persian Empire, the Persepolis. Then Pasargadae, and Naghsh-e Rostam (Necropolis). Your Shiraz tour would start by visiting Eram Garden, Karimkhan Citadel, Vakil Bazaar and Saray Moshir and tombs of Hafiz and Sa’adi which are two of Iranian most outstanding poets to feel the taste of Persian Literature. A day after you will be escorted to the Shiraz airport for your departure flight. + Explore fabled capitals of ancient empires with our expert Trip Leader, well-spoken and experienced in sharing his native land with travelers. + Stroll in magnificent Persian gardens that trace their design principles to the days of Cyrus the Great. + Mingle with local residents and vendors in three colorful markets including the only bazaar in the world recognized as a UNESCO World Heritage site. + Discover Pasargadae and Persepolis, cities of the Achaemenid Empire that rank among the world’s greatest sites of antiquity. + Get to know the warm Iranian people as you dine in fine local restaurants we’ve selected for their delicious Persian food and friendly ambience. After breakfast, you will visit National Museum of Iran, where you can see fabulous historical items from 5000 BC to the advent of Islam in Iran which shows brief history of our Land. The day ends with another World Heritage Site, the Golestan Palace complex (Ethnographical Museum, Shams-ol-Emareh edifice, Marmare Throne and Mirror Hall) that built during the Qajar Dynasty that rose to power in the late 1700’s, this fabulous walled complex is centered on a landscaped garden with tranquil pools. Today we get out to Kashan, a town known for its superb ceramic industry dating back to the 12th century. In Kashan, you will visit Boroujerdi and Tabatabaei Traditional House and Fin Garden (A registered site in UNESCO world heritage). This very early Persian garden reflects ancient landscaping principles that trace their roots to the time of Cyrus the Great in the 6th century BCE. After breakfast drive to Isfahan, on our way to Isfahan, you will visit Abyaneh village. Abyaneh Village is known as the Red Village because of its red soil and houses. The houses of Abyaneh bear an ancient architectural style, featured by the use of clay as the construction material and latticed windows and wooden doors. After arriving in Isfahan, in the afternoon visit some of the centuries-old, still elegant bridges that span the Zayandeh River. The 14th-century Shahrestan Bridge, for example, evokes the greatest aqueducts of ancient Rome and is the oldest bridge in Iran. Other famous bridges on the Zayandeh River are Sio-ce-pol and Khaju. Continue your exploration in Isfahan at another UNESCO World Heritage Site. Simple at first glance but wondrous in its rich detail and bold design, the Masjed-e Jamé is another masterpiece of Iranian architecture, covering nearly 5 acres in the heart of this historic city. This is one of the oldest congregational mosques in the country, and its construction and embellishment over the past twelve centuries illustrate a number of important periods in Islamic architecture. This afternoon, your exploration continues in Imam Square. This 17th-century site is one of the largest public spaces in the world. Here in the square, you’ll visit the 17th-century Shah Mosque, revered as a masterpiece of Islamic architecture and easily recognised by its magnificent tile-work and soaring cupola and minarets. In the Ali Qapu Palace, you’ll marvel at its beautiful music rooms and the balconies where Safavid kings would sit to enjoy the polo matches unfolding in the square below. You’ll end your day exploring the Qeisarieh Bazaar that surrounds Imam Square. With hundreds of local vendors that specialise in traditional arts and crafts, it’s a wonderful place to shop for pottery, enamel, jewellery and delicately inlaid board games. Next up is Chehel Sotun. Set in a landscaped and forested park in front of a tranquil reflecting pool, this graceful pavilion was built by Shah Abbas II for entertainment and court receptions. Entering through a portico with twenty slender wooden columns, you’ll discover soaring halls embellished with frescoes, paintings and mosaics; the Hall of Mirrors is especially breathtaking. On the way to Yazd visit Nain (an ancient community with origins dating back to the 8th century) and Meybod (It offers a number of fascinating sites to visit including its caravanserai) historical cities. After breakfast visit Yazd Fire Temple and Tower of Silence. Yazd is also the center of Iran’s Zoroastrian community. At the Tower of Silence, you will learn about one of the traditions of this ancient pre-Islamic religion. At the Yazd Fire Temple, you will see a flame that is said to have been burning for the past 1,500 years. It is an important pilgrimage site for the faithful. Then visit the Friday Mosque, built in 1324, where you can gaze upon the tallest minarets in the country. Among the many other historic sites to be seen in Yazd is the Dolat Abad Garden. In the morning after breakfast drive to Shiraz. En-Route, visit Pasargadae (A registered site in UNESCO world heritage), Persepolis (A registered site in UNESCO world heritage) and Naghsh-e Rostam (Necropolis). Pasargadae was the first dynastic capital of the Achaemenid Empire, founded by Cyrus II the Great, in Pars, homeland of the Persians, in the 6th century BC. It was the capital of the first great multicultural empire in Western Asia. Spanning the Eastern Mediterranean and Egypt to the Hindus River, it is considered to be the first empire that respected the cultural diversity of its different peoples. This was reflected in Achaemenid architecture, a synthetic representation of different cultures. The archaeological excavations of Persepolis rank with Ephesus and Pompeii as among the world’s most impressive sites of antiquity. Among scholars of the ancient Persian world, it’s regarded as a masterpiece of Achaemenid architecture, urban planning, construction and art. Naqsh-e Rustam is one of the most spectacular and awe-inspiring ancient sites of the Achaemenid Empire, consisting of the colossal tombs of Persian kings dating back to the first millennium BC. It stands as a lasting memory of a once powerful empire that ruled over a significant portion of the ancient world. After breakfast will start your full day tour of Shiraz. At first, you will visit Nasir-al-Mulk Mosque (Pink Mosque). It built by the order from one of the lords of the Qajar Dynasty, Mirza Hasan Ali Nasir-al-Mulk, it took 12 years to complete in 1888. Its interior reveals a magnificent masterpiece of design with stunning colours. This is a space where light and worship intertwine. The mosque comes to life with the sunrise and colours dance throughout the day like whirling dervishes. It reflects on the ground, walls, the arches and the towering spires. It even reflects on the visitors as if a colourful ball is hit by the first sun ray and explodes to thousands of butterflies all around. After that, You will also visit Karim Khan Citadel. Built during the Zand Dynasty. Then you’ll have time to explore and shop in the bustling Vakil Bazaar, home to hundreds of stores, beautiful courtyards, and even an ancient caravanserai. In afternoon, you’ll visit the lovely garden tomb of Hafez, of our most outstanding poets to feel the taste of Persian Literature. End your final day in Iran on a tranquil note in the beautiful orange-scented Narenjestan Garden, laid out in the 19th century during the Qajar Dynasty. You’ll be escorted to the Tehran IKA airport this morning for your departure flight.